The time-tested PFAFF® Original IDT™ System guarantees the optimal feed you expect. Everything stays in place. Lightweight and silky fabrics don‘t pucker; stripes and plaids match perfectly; curved seams are easy, with very little pinning required. 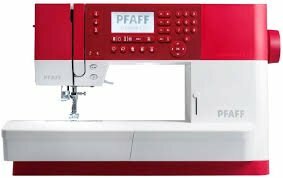 The PFAFF® creative™ 1.5 sewing and embroidery machine is the perfect choice for quilters, home decor sewers, fashion enthusiasts – anyone who creates. The sewing area to the right of the needle is ideal for sewing large amounts of fabric or batting.